Contributed by Dion Kliner / A preamble: An elephant in a living room, as unlikely as it is to find one there, would never be mistaken for a couch. That is something of the situation that Jeremy Hof’s work puts one in; forcing the unfortunate necessity of bringing up the question of a particular piece being either painting or sculpture when an answer should be obvious and unnecessary. At this date the general question of something being either painting or sculpture is about as interesting as the question of whether something is art or not, and as equally productive (which is to say not at all). And yet here the question sits (I imagine it grinning), persistent and unavoidable. The real interest of Hof’s work is how it makes one think about painting and sculpture. To begin with, art always moves from a condition of sculpture to a condition of painting; which is to say that it moves from the dedifferentiated material, through processes of refinement and organization, to illusion and representation (even if that representation is only a demonstration of the material’s physical properties, i.e. the work of canonical Process artists like Lynda Benglis and Richard Serra). The way Hof moves his Paint Rocks and Paper Works is in a similar direction. From objects that are sculptural and haptic Hof uses methods of display to subtract sculptural qualities and mimic the painterly and optic. But if one pushes past the flatness that Hof’s displays induce, one arrives back at a new understanding of his work as sculptural. The general transition in the Paint Rocks and Paper Works from sculpture, to painting, to sculpture is the same as if one moves from side, to front, to opposite side of any of the individual works. The fact that the work won’t remain flat is like a synesthetic declaration by Hof that color is not just form and a vibration on the screen of the retina, but that color is object. On first seeing the Paint Rocks lined single file across their eight narrow shelves, it takes a few minutes to realize that “rocks” (in both the title of these pieces and the exhibition’s title, “Paint Rocks Paper Works”) is understood more accurately as an informal verb than a noun. A better translation would be, “I love color and color equals paint, signed JH.” The rocks are not materially rocks at all, neither are they painted. They are solid chunks of acrylic paint produced through an arduous process of filling molds with liquid acrylic that can take up to two years. They are illusions of rocks; examples of potential, and potential lost. The soapstone, alabaster, and other types of stone from which the molds are taken still represent future potential; they are in a state of arrested becoming. If the Paint Rocks were large chunks of pigment, or the ore from which pigment comes, they could be ground to powder and mixed with a medium to be used for painting. Cast, the material of the Paint Rocks is at the end of its life; as far as it’s going to go in becoming. As individual objects, or as a group, the Paint Rocks seem resolutely sculptural. Attached to the wall, the in-the-roundness that is one of sculpture’s strengths is frustrated in favor of a mode of display that effectively removes their backs. The shelves and their contents are flattened out by giving them a primary face, albeit with supporting side views; turning them into a high relief frieze of sorts. Because of the uniformity of each color and the matte finish of most of them, light is absorbed and surface detail lost. Silhouette becomes the most striking feature, again accentuating flatness. Stubbornly, though, even while the Rocks inch closer to being painting (by hanging on the wall, having a predominantly frontal view, and a pretense to flatness), they are accentuated as sculpture by drawing attention to, and making one fonder for, what is not there: the ability to circumambulate, and all that entails. Lite Pink on Paper, Lite Purple on Paper, Cobalt Blue on Paper, and Multi Colour on Paper XXL grow as objects through the gradual accumulation of horizontal layers of acrylic paint; colorful, little, tabletop mastabas. Their short sides are fairly sharp, the long sides ragged making it easy to imagine swiping across the top in each successive layer with a flat tool and having excess paint squeeze out at its edges. The sheets of paper on which they are constructed are buckled and curled from the drying paint. What the shelves do to the Paint Rocks, the vertically hung, glass-fronted shadow boxes do to the Paper Works: move them from sculptural to painterly. From directly in front the, Paper Works flatten out to look like solid colored centers surrounded by multi-colored borders. Because the center of Multi Colour on Paper XXL is white, it looks like it might be the blank paper on which it’s painted with multi-colored border. It also can seem to reverse its projection into space and look as if its center is its lowest point, a central depression with rising sides rather than a raised platform. 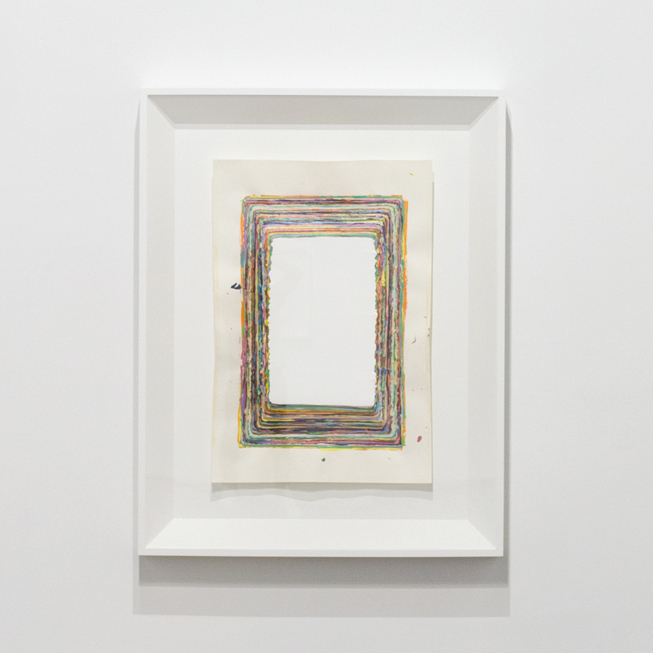 In each of these Paper Works, paint, paper, and shadow box are proportionately equal. The true projection of the Paper Works as objects notwithstanding, the alignment tricks the eye into the illusion of a traditional recession into space. Lines drawn from the outside corners of the box recede along the beveled miters, across the back of the box, through the corners of the paper, and up the corners of the slab to a perfectly centered vanishing point; but the Paper Works aren’t flat. Following their projection as objects forwards, that vanishing point turns around to be your eye. The vanishing point may fluctuate, but the compositional focal point does not. And what is that central point of interest? Color. Unlike the Paint Rocks, the Paper Works are not illusions of something other than themselves. They are paint slathered layer on colorful, luscious layer, as pedestrian as putting one foot in front of the other in an effort to move forwards, and yet beautiful and captivating. From their presentation I suppose we are meant to think of painting. Should we rather think of specimens, because paintings are not the only things to be displayed this way? Specimens of painterly desire and ambition free of image or pretense. By shelving the Paint Rocks and boxing up the Paper Works they have been restrained and tamed, as has the spectator. Hof has removed the potential for the works to show themselves fully, and the spectators’ potential to fully participate in how they are seen. If there has to be an answer for whether Hof’s work is painting or sculpture, let it be his admission that it is a response to his dual loves of making objects and color. That sounds like sculpture, and Hof, therefore, a sculptor (perhaps with a case of color envy) with a painter’s autocratic desire for control. “Jeremy Hof: Paint Rocks Paper Works,” Monte Clark Gallery, Vancouver, Canada. Through November 18, 2017. About the author: Dion Kliner is a Vancouver-based sculptor and arts writer who has published more than forty reviews and catalog essays.